Mezcal and tequila are brothers from the same mother and therein lies the confusion and misunderstanding. Both are born from the same biologic, the agave plant, also known as the Century Plant. 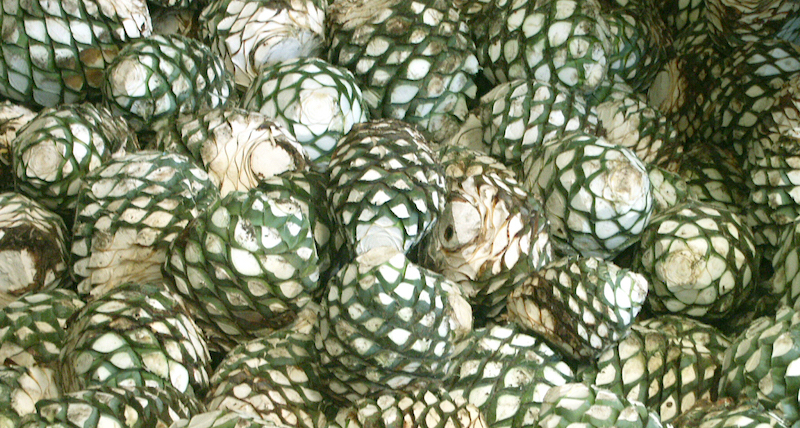 Mezcal and tequila are both taken from the piña, and they are both heated, then fermented, then distilled. But don’t get carried away by the similarities. These are decidedly different spirits with markedly different aromatic and taste profiles. And, let’s get this out of the way early, only one has the worm (that would be the mezcal), which except for a college fraternity initiation rite, does not have to be eaten or used for any happy purpose. The worm, besides the yucky visual effect, is really just a hokey marketing device to influence the taste. The worm is the larvae of a caterpillar or a weevil that hangs around the agave plant, and if allowed to reproduce wildly can actually kill the plant. Just in case you are interested, the red worms are considered the tastiest. To be clear, I did not come by this information through taste tests. Full confession: there are many things I have done in my life of which I am not proud, but eating the worm is not one of them. I have never. The mezcal/tequila relationship is quite simple: all tequilas are mezcals, which is a broad category defining spirits made from agave plants. The limiting legal requirements are that all tequilas have to be made from only the blue agave and are considered best when they are created entirely in the Mexican state of Jalisco, which by law they must be. Please refer to previous Happy Hour column focused on tequila. Mezcals originate from a broader geographic area and can be born of as many as 30 different types of agave in 9 states. Those key differences of origin explain why the range of aromas and flavors in mezcal are so varied, interesting and diverse. If you like to cook, then you can appreciate the difference between putting a steak in the oven in the kitchen and putting that same cut of meat on the grill in the backyard. I am self-considered “old school.” Flavored spirits may be interesting but at best, in my opinion (which accounts for very little, and for nothing around my house), they have only limited applications. Once you have made one cocktail with a camembert flavored vodka, you have likely done just about all that spirit can do. To mezcal’s credit, there are no flavored mezcals. I like that fact. And if imitation is the sincerest form of flattery, the current mezcal craze has caused at least one tequila producer to bring smoke into their production technique. An interesting turn of events. On the market today, mezcal, the category, is “hot.” Because of the endless variations of tastes and smells, mezcal presents the consumer with a huge variety of opportunities to create cocktails or just for sipping enjoyment. This opportunity to capture market has not been lost on producers of mezcal. They have upped their game, bringing more quality to the category. The complete turnaround in the way mezcal is produced has created happy outcomes for all concerned. If it has been awhile since you have tried mezcal, this spirit is no longer the stuff of dare-you drinking games. Happily, when one fad dies, another movement on the drinking landscape, likely more permanent with better quality, rises. Obviously any cocktail that calls for tequila can make good use of mezcal. That being noted there are instances where mezcal’s aromas and richer flavors can add in a more interesting manner to the concoction. In a cocktail shaker, stir the mezcal with the honey until dissolved. Add the Cocchi Americano, grapefruit juice, lime juice and salt. Fill the shaker with ice and shake until well chilled. Fill a large glass with ice and add the seltzer and grapefruit wheel. Strain the cocktail into the glass and serve. Maguey is another term for agave. Add all of the remaining ingredients except the garnishes and shake well. Strain into an ice-filled rocks glass and garnish with the grated nutmeg and orange twist. Read Happy Hour here on myneworleans.com every other Wednesday, and listen to The Dine, Wine and Spirits Show, hosted by Tim, every weekday, 3:00 – 5:00 p.m. on WGSO 990AM and streamed and stored (podcast), at www.wgso.com. Also, check out Last Call, Tim’s photo-feature every month in New Orleans Magazine.